Let me tell you a little story. 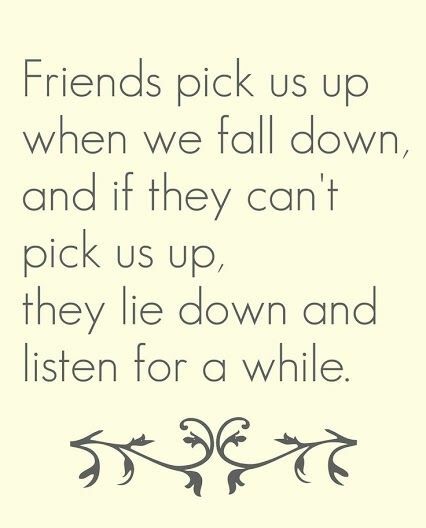 There is nothing quite like having a friend you can depend on. Most especially an old friend that you can sit for hours with reminiscing on silly memories, laughing until your side hurts, or one of you can’t breathe. My friendship with Chloe Keeler can be most closely compared to the friendship of Diana and AnneWith an ‘e’ of Green Gables. If you don’t know what I’m talking about you need to go watch Anne of Green Gables. If you can get past the goofiness you’ll find it to be a fabulous story about love, and friendship. For a friendship does not last without a bit of humor. Chloe is the one who I first told I had a crush on my now husband. She is the one who encourages me when I’m down, and sends me cards that say ‘tough cookie’ on them when such times come around. She is the one who left flowers on my doorstep when I was dreading the dentist. She is the one who listens to me quietly on the phone while I ramble and vent. She is the one who sends me cards on every holiday. She is the one who doubled as my hairstylist, and photographer at my wedding. She is the one who left flowers, tissues, and candy on my doorstep when we arrived home from our court case with Samson. 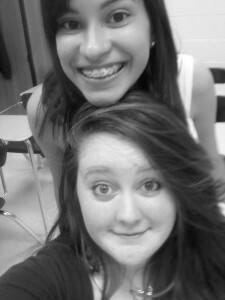 She is the one who dragged me from the house when I was hopelessly upset over losing my dog. She is the one who gave multiple baskets of puppy products when we got Bingley, including a binder full of facts and tips which she went out of her way to compile. When moments like those come along treasure them. There is nothing like having someone whom you could tell anything, and they won’t judge you, or leave you. When you go through something difficult and your friend is still by your side, that’s when you know it’s something to hold onto. It’s not about gifts, or fancy get togethers. 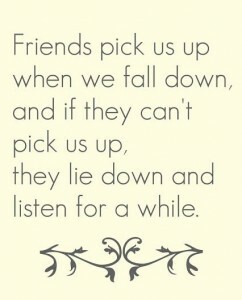 A true friend is someone you can just sit with, and being in their company is more than enough. It is something that I’d wish for everyone to have, and I’m so very grateful to have it myself. I love you dear friend. Thanks for being you. With wedding season fast approaching I’ve felt an itch to do a wedding series. I figured I’d start out with some honest truths, then we can get into the fun stuff. I have found that there is nothing sweeter than a bride to be. She sighs and complains of her wedding planning as if it’s a chore. But deep down she is ecstatic and has been waiting for this day all her life. Yes, I walked around with those bridal magazines that were a total rip off as they are mostly full of ads, and overpriced dresses. But I wasn’t ashamed, I finally had the privilege of flipping through those pages, I was going to take it. Every couple wishes for nothing more than an engagement that’s full of sunshine and daisies. But unfortunately as some of us know all too well there are those brief moments where reality sets in. You know reality. That thing that comes along and squashes all your hopes and dreams. Nobody likes him. When the love of your life becomes your Fiance you refer to him as such with perfect annunciation. You gladly retell your proposal story over and over while you hold your left hand out to be admired. You’ve decided where you are going to say your vows, decided what you will wear. And you’ve experienced all of those moments in between where you said yes, and made important decisions with your soon to be spouse. I would love to say that I took the time to sit back and cherish all of those moments. But no, like most brides to be I was completely overwhelmed. Mr. Reality crept his crummy little self in. [Now Pause] You should know that I often find myself needing to share the thoughts people just don’t talk about. Say what you will, but know that I cannot stop it. I have an unquenchable thirst to be a voice for the weak, and silent. An honest voice for those who are willing to listen. As planning commenced for our wedding I proudly stated that my mother would walk me down the aisle as if it didn’t bother me. I hadn’t spoken to my dad since before I graduated high school. He hadn’t even met Brandon. But secretly I felt just a bit sad all the way to the aisle that I had no Dad around to walk me. I’d love to say that our wedding was all planned flawlessly, and I got everything I wanted. But I settled for my dress, because it was the only one in budget. 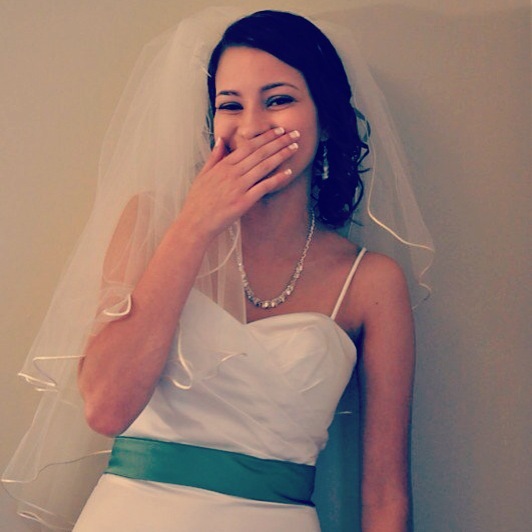 I cried after my bridal shower, because I had a head cold and felt so ill, all the while trying to smile. I felt blessed to have so many women shower me with love but I was so exhausted by the end of it all I didn’t know what else to do but cry. I hauled all of our gifts into the apartment while Brandon watched happily, and once I saw him I just lost it. One night I even panicked, and desperately considered elopement. Bride to be, don’t fret. Reality gets to the best of us, and I’m pretty sure most couples consider elopement at some point. Back me up? By no means do I share this information for pity. I write this post for those who are desperately attempting to piece their weddings together while plans crumble, and dreams are simplified. People will let you down. Things will fall through. Limitations will close you in. Don’t lose sight of what your wedding is all about. How you and your Fiance handle those situations will show how the two of you will handle such shortcomings in the future. So dear Bride, it doesn’t matter what you wear, or who is at your wedding. It doesn’t matter what comments have been made, who you are possibly offending, or whatever fell through. It doesn’t matter that a bridesmaid let you down, or your hair was not what you pictured. What truly matters on your special day is who you say your vows to, and why. You know this, I’m certain you do. But do you believe it? Because beautiful bride, if you don’t you should. Here is the definition of a Rambling:According to dictionary.com Taking an irregular course. Straying from one subject to another; spread out irregularly in various directions. Now take note, this is a serious rambling, if ever there was a rambling. If there’s anything my heart breaks for it’s divorce, and broken marriages. I see the struggle on people’s faces. I see the hurt, and feel their grief. There was a night when I worked at Starbucks I was sweeping the cafe. There was a couple sitting in the corner bickering. There was another man with them. He may have been a lawyer, a friend, a family member maybe, attempting to mediate. As I got closer I caught a few of their bitter words. I gathered that they had been going through a divorce, and were in somewhat of a custody battle. “I don’t understand why I can’t see my children more often. There are times that you’re away, and I’d love to spend time with them.” the man said. “You don’t see them more often because they don’t want to spend time with you.” The woman replied in a harsh tone. Every word that escaped her lips was so venomous. It pained me to even think about how she had gotten to that point. How hurt has she been? How tired is she of fighting? They battled back and forth for a while until one of my supervisors felt the need to come over and quiet them as many other customers were beginning to feel uncomfortable. The rest of the couple’s words somewhat melted together in heated frustration. I couldn’t get past her words. “They don’t want to spend time with you.” I don’t know the circumstances, and I certainly don’t know the man or woman. But I didn’t need to. My heart still broke for them, and their children. Were their insults at all helpful to the situation at this point, or were they only negatively affecting their children for life? I wished so badly for them to see themselves from my perspective. I felt for the woman but there is no doubt I felt for the man as well. His words quickly reminded me of that last scene in Mrs. Doubtfire. Where Robin Williams is fighting for partial custody of his children. The idea of someone telling me I can’t be with them, I can’t see them every day.. It’s like someone saying I can’t have air. I can’t live without air, and I can’t live without them. I wish there were more parents out there like that. Ones that would fight for their children no matter the circumstances. Growing up in a broken home caused me to grow up very quickly. I’m so grateful for my mother was always unbiased towards my dad. She never spoke negatively of him to me. She wished for me to form my own opinion of him. I don’t know how she did it, but I am grateful for it. I didn’t need to know details of their marriage at such a young age. Too many adults share information with their children that are not for children’s ears. The child begins to view one parent in a different light because the other is telling them so. It’s so very manipulative and upsetting to me. Allow your children to grow. Speak highly of your spouse. Show your children what a happy healthy marriage looks like. I never believed people could truly love one another forever. It wasn’t until I met Brandon that I knew for sure it was possible. There is no trick to marriage. You will never have enough helpful tips. And it isn’t just blissful after 15 years. It’s hard work day in and day out [Period] Sometimes Brandon doesn’t put his dish in the sink. Some days I let it consume me. Flustered, I’ll mumble to myself “Doesn’t he know by now?” Then some days it’s an honor for me to put his dish away. Because that extra dirty dish belongs to my husband whom I love. Those dirty socks lying just a foot from the hamper, I groan as I toss them in. But then I remind myself who they belong to and I smile. “Babe!” I’ll say in shock, “You’re socks have done it again! They’ve jumped right out of the hamper. I don’t know how they do it.” If those dirty socks weren’t there that would mean I had no husband there. So rather than live in frustration I have to choose to find those little quirks, and cherish them. This is another one of those “Go tell your significant other you love them” posts. And do you know why? Because it’s necessary. Every day, it’s necessary. That was our night. We ate our burgers bunless that night. They still hit the spot, though they were eaten later than expected. Once we finished dinner B went out to Lowe’s to put an end to those dirty rodents that ruined our food. We had discovered that there was a small hole in the molding that apparently must have led to our crawl space which is where they had journeyed in. 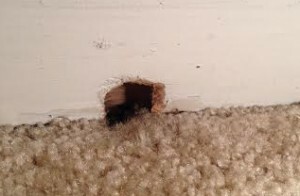 Isn’t that just the coziest little mouse hole? If you have mice that come in through a hole apparently all you need is the coarsest steel wool you can find. Shove that down the hole, and lots of it. They can’t chew through it, or they’ll ruin their teeth. Then apply a bit of caulk to plug it up. Voilá, no more mice invading your home. 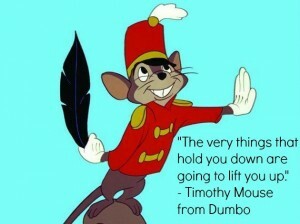 Perhaps I’m a kid at heart, because there is nothing quite like watching a disney movie when I’m sick. 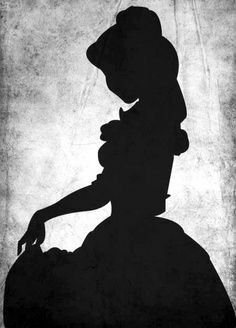 Before you roll your eyes at the kiddyness of this post admit to yourself, we’ve all learned a little something from a disney character. Here are my top 10 favorite Disney quotes to help get you through the week. Take a deep breath, bring out the kid in you, and take the following simple quotes to heart. Ever since I was little my mom always told me to find someone who called me beautiful. “Pretty means on the outside.” She’d say. “Beautiful is on the inside.” It was a truth I always held onto, and come to find out she was right. I did a little research on the definition of each word. Beautiful: Possessing qualities that give great pleasure or satisfaction to see, hear, think about,etc. ; delighting the senses or mind. When you do a search for beauty all you’ll find is tips for makeup, different haircuts, hair styles, and clothing. Why is this? Images of perfection flood our minds. They’re all things that cover, and hide our natural selves. This has caused me to recently question. What is beauty? Is it in how we see ourselves? Is it in how others view us? Or is it both? I write to make sense of things, so let’s see if I can jot a few thoughts down, and figure it out. Join me? While it’s wonderful to be called pretty, to be called beautiful is much more gratifying. When Brandon took me on our first date he told me I looked beautiful. He didn’t just say it. He admired me for a minute, pondering he looked into my eyes, and said it. My eyes lit up immediately, and I knew he was for keeps. I told my mom, and she smiled. Beauty is not in your looks. It’s how you carry yourself. Woman stare at themselves, fixing their cowlick, adjusting their blouse. They change their outfit, change their hair, change their wardrobe all in a desperate attempt to discover beauty. I am guilty of it, I fully admit. When all along it’s when I feel happy with myself, and my life that I feel most beautiful. With daily tasks, stresses, and fatigue it’s difficult to feel beautiful every day. But that’s only because we are missing the bigger picture. Beauty is not about maintaing a pretty appearance. Beauty is an inner struggle within ourselves, that we must learn to discover. 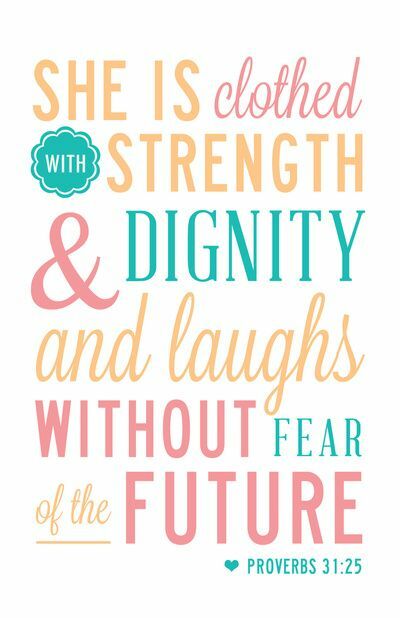 When I’m feeling crummy, and so not beautiful I remind myself of the Proverbs 31 woman. Surely someone who is worth far more than rubies is a beautiful person. The verse speaks nothing of her appearance. It speaks only on how she is clothed in specific qualities. 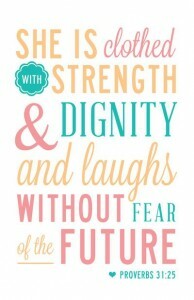 There is also something to be said about laughing without fear of the future. How difficult must that be? She knows her family is taken care of, and her husband praises her. What’s does she need to worry about? If there’s any quality that will widdle you down, and cause you to not feel beautiful it’s worry. Live the life you wish to live. Do the things you love. Spend time with the people you care most about, and let go of the things that cannot be changed. One morning I was taking a shower minding my own business when I heard grunts and groans a few feet away. Brandon was standing at the sink in the bathroom. There was a bit of clanging, and more groans. I kept my ears open for more insight. B began to faintly mumble under his breath “Well that was a bad idea” he said. Seconds later I heard a thud. I peeked my head out of the shower in confusion to see B lying there on the bathroom floor. His eyes had rolled to the back of his head, and all the color had left his body. I called his name in confusion as I scanned the room. Pliers, and a pocket knife sat on the counter. My eyes wandered downward to find a small trail of blood from the counter to him. What could he have possibly been doing? He came to within a couple seconds looking up at me. He claims he was about to say “What? I’m taking a nap.” then he realized he was on the bathroom floor, and that didn’t make sense. “Woah.” he laughed. “I just passed out!” I ran to grab him some water, and helped him to the bed. Brandon had this menacing wart in his finger. He tried every kind of over the counter medicine, home remedy you could think of. Nothing worked, the wart kept growing, and becoming more of an annoyance every day. So he had the brilliant gutsy idea of cutting, and pulling it out. Who knew that seeing surging blood flow from his finger would cause him to feel faint. Unfortunately, only a small piece of the wart was actually removed in this amateur procedure. I sat on the bed trembling as I watched him. It was such a scary moment to not have known what had happened to him. He was so pale now, he nearly looked green. My fingers felt cold and clammy. “I don’t feel good now. You’re making me feel nauseas.” I told him. I stood up and walked toward the bathroom. Within the next couple minutes I found myself opening my eyes slowly. I looked up into a spotty haze. Brandon was over me. “Are you ok?” he said. “Sure, I was dreaming.” I said. “You just passed out.” he laughed. I looked over. Yup, I too passed out on the bathroom floor. I suppose with so much shock, and seeing B so pale made me a bit queasy causing me to repeat the act. We wriggled ourselves back to the bedroom, ice waters in hand. We laughed, we hugged, and we thanked God for each other that day. We spent the rest of the morning in bed, tending to one another when needed. There’s something about your spouse not feeling well that makes you extremely grateful for them. We don’t know what tomorrow brings. The day we both passed out put that fact in perspective for me. We continue to be hopeless when it comes to blood and fainting. I’m not quite sure how we will be able to handle one another when something more serious comes along. 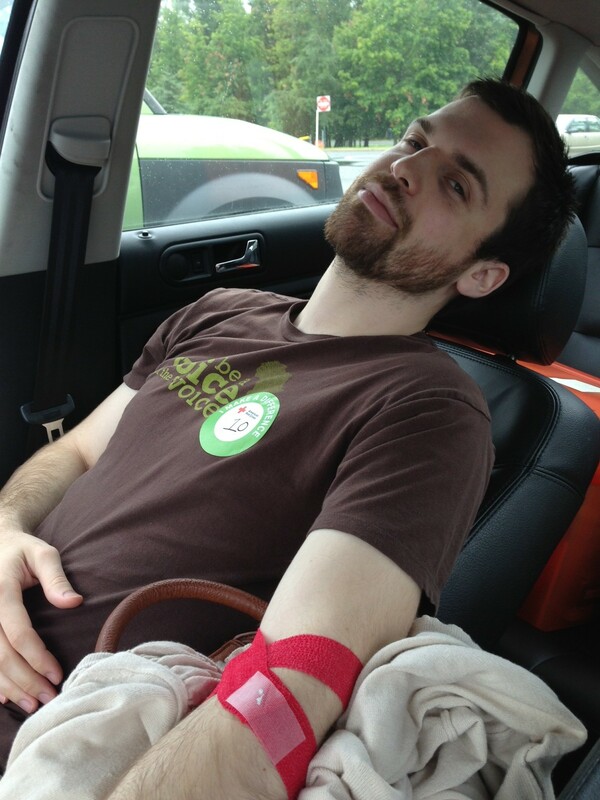 Last year B donated blood, and it was a mess. He started to feel faint, so they called me over to sit next to him. He lay there looking deathly ill. I held his cold hand, but had to turn away. He spoke slowly, lips turning purple. I apologized, and laughed. “You’re just so pale, it’s making me feel sick again.” I told him. I grabbed the orange juice he was sipping on, and the woman taking his blood rolled her eyes. “You too?” she said. I was so embarrassed. What a horrible wife I am taking my faint husband’s juice for myself. Brandon finished his pint of blood with pride that day, but I’m not sure he’d ever really wish to relive that experience again. To the man waiting in line of the busy store: Your son moans, and presses his hands to his ears. His ears are so sensitive, he feels closed in. He feels confused, and you hold him gently. You kiss the top of his head and calm him. I saw you. To those of you who are in public with your children: I’m sorry for the people who stare. I’m sorry for the people who scrunch their faces and scoff. I’m sorry for the people who roll their eyes. I’m sorry for the people who point. I’ve seen you, and I am just as frustrated. To the parents who take their children to therapy: You smile at your child’s progress. You watch in amazement as they are able to do things you never thought possible. I watch you, and I am joyous with you. I feel the need to apologize to you for the ignorance of others. They do not understand. They don’t know the tears you have shed for your children. They don’t see the mountains of doctor’s bills, or insurance loopholes you have to jump through. They think your child is rambunctious. They think your child is a disturbance. They think your child should be able to walk or speak. Shame on them. I’m sorry for every finger that has pointed, every rude comment you have overheard. It may not be much, but may I tell you that you are beautiful people, and I admire you so. Do you know that you are built to be stronger than most? Do you know that I see you, and wish to express my understanding? There’s more of me out there, so keep your head up. Keep loving your little one, even through the heartache. In a world full of selfishness they need you. I have a pet peeve, and it’s a silly sort of thing. I am very intentional when saying “We bought our first house” rather than our first home. I know it’s silly but it’s the truth. It’s the first house we’ve bought together. It’s not our first home. Our first home was our apartment. That was the first space we shared together, and made our own. Growing up we moved several times. Which was not necessarily a bad thing. I owe my willingness for change to this. My need to redecorate and keep things fresh also derives from uprooting. It’s also the reason why I can randomly purge ridiculous amounts of items at any given time. Alright, purging mostly had to do with my cleanly aunt who can’t handle clutter. Every time we moved it was time to gather the troops. My aunt would come over and help my mom with packing. Somehow every time we settled down somewhere my mom seemed to be able to collect huge amounts of.. well stuff, just lots and lots of stuff. Thus making moves rather difficult. We would be sitting among massive amounts of my mom’s precious possessions, secretly tossing them when my mom turned her back. My aunt would look me in the eyes, trash bag in hand, and say “Natalie don’t collect junk, you learn to throw it away, or give it away.” I could see she was really trying to instill those words in me. For fear that I would end up the same. It was great advice, and I’m happy to say that I followed in my aunt’s footsteps. How many sentimental items are in your basement collecting dust? How is that even being enjoyed? 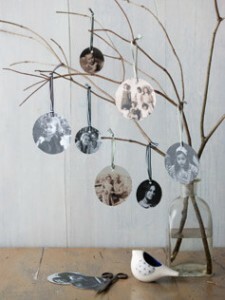 Find something creative to do with your sentimental items, or toss them. Before you know it they will be closing in on you! My point is, that I never felt like I had a home. We were either living with other people, or in a rental for a short amount of time. Nothing was ever permanent. When I shared my first space with Brandon it was the first time that I actually felt like I was home. Purchasing our first house was a big step, and I am in love with it. But it was not our first home, it’s our current home. It wouldn’t matter where we lived or what house we owned. 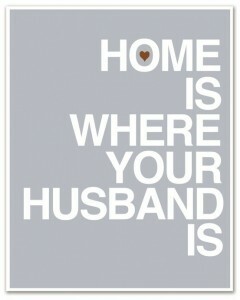 Wherever B is, is my home. Many families choose have a gallery wall of family photos to display. I wanted to have something that incorporated our family in our home, but also fit well with our rustic theme. I came across this simple family tree on Pinterest. The best part about this project was that I didn’t have to purchase anything for it. Those are the best kind of DIYs. I have so many empty bottles and vases under my sink that I’m saving for some important purpose.Always good to save, you never know when they can come in handy. Pictures, or Card stock to write names on. Decorate your vase however you’d like. I added a small piece of lace around mine. Toss your twigs in the vase, breaking off any small pieces that don’t fit right. I added small pebbles at the bottom of the vase to help the twigs stay as upright as possible. Then decide whether you want to cut out pictures of your family or write their names on paper. I preferred the uniform look of names on paper. Yes, I am that OCD. The book pages at the bottom of the cardstock was a last minute decision and I love the way they turned out! Old books are also a great thing to keep laying around. 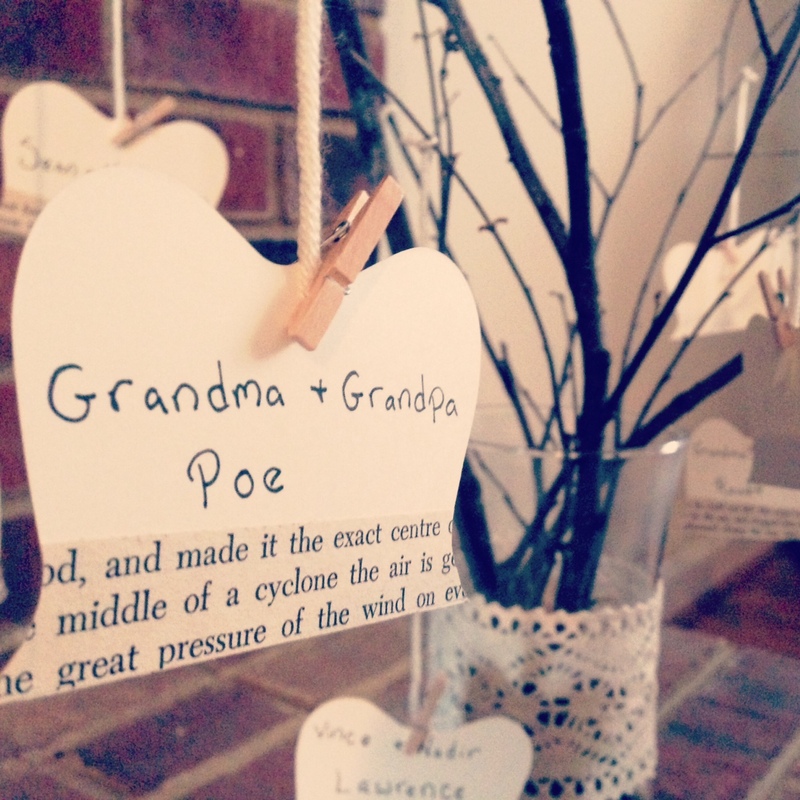 There are so many crafts that can be given a vintage touch by adding book pages. If you don’t have any books you want to tear the pages out of find out when your library is having a sale. Usually you can fill up a box or bag for chump change. Hit up Goodwill or a yard sale in the spring. My sister is a 4th grade teacher, and she was organizing her classroom’s library when she came across a beat up version of the Wizard of Oz. She was about to toss it as I looked on eagerly. Well if you’re going to toss it then I’ll take it! I said. A nice classic book is always nice to have for craft projects like this because if anyone gets close enough to read the page there won’t be anything odd on the cut outI’m speaking from personal experience of course.. If you are using book pages, cut them to fit the cardstock, and glue them together. Then punch holes through and attach the yarn. 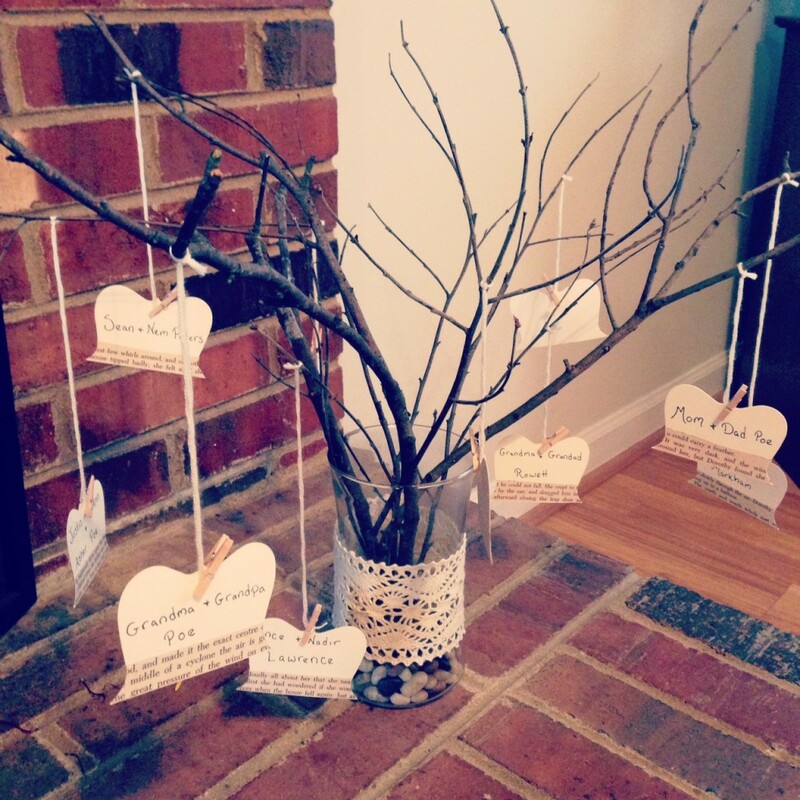 I used little clothespins I had from when I made my front door frame decor. If you don’t have clothespins you can always glue or tie your string to your cardstock or photo. All you have left to do is tie the string to the top of your twigs and voilà! You have yourself a family tree.